Created in 1959, Parque Nacional Laguna San Rafael covers an area of 6,726 square miles (17,420 sq km) and includes the Northern Patagonian Ice Field. 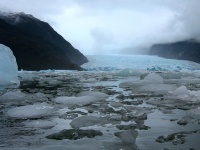 It was named after the San Rafael Lagoon that was created by the retreat of the San Rafael Glacier, and has been designated a World Biosphere Reserve by UNESCO. A fjord more than 10 miles (16km) long is one of the park's principle attractions, along with some of the highest peaks in Patagonia, several glaciers, lakes and a rich variety of bird and sea life. While the majority of visitors to Laguna San Rafael never set foot on land, the magnificent views from the boat will no doubt stay with them for a lifetime. If you take one of the larger boat trips to see the famous glaciers in the park you will almost certainly be given the opportunity to approach the ice flow in smaller boats and get up close to the glacier. For the really adventurous there are also multi-day sea kayaking tours of the area. Most visitors describe the trip as a once-in-a-lifetime, unforgettable experience and it is not hard to see why when looking at photos of the landscape. The glaciers are melting, making this attraction even more poignant and special; in a few years' time the landscape may be very different.